Kids' Book Review: Review: Knowledge Encyclopedia Human Body! 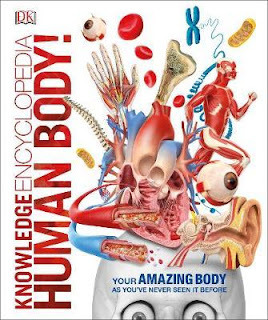 Review: Knowledge Encyclopedia Human Body! Another stunning reference book from the geniuses at DK. This book packs so much detailed information in that there isn’t a question about the human body the kids can come up with that it can’t answer. The amazing graphics really make this book stand out. It has detailed representations of bones, muscles, teeth, organs and blood vessels. It even has fascinating visual representations of microscopic inner structures such as neurons, stem cells and glomeruli. The layout is perfectly balanced between text and graphics, with plenty of short, easy to digest facts making the book seem less dense, despite the wealth of information it contains. The book is broken up into sections based on parts of the body, as well as sections on what makes up a body, body systems and body science. There is a section on reproduction that is well explained in clear and factual language. The extra information pages at the back contain interesting snippets such as a timeline of medical milestones, what future medical advances mean for our bodies and how bodies cope in space. The section on record breakers was also popular in my house, containing facts about human heights in different countries and how they have changed over the last hundred years, as well as life expectancy and feats of physical endurance. It is the visual elements and layout that really draw you into this book. On every page your eye is drawn to some fascinating image that you can’t look away from and are compelled to read about to find out more. This really will make a scientist out of any curious kid. Knowledge Encyclopedia Human Body! is a must have reference book for home or school libraries that is suitable for children from mid-primary right throughout high school. My eight and ten year olds were fascinated by it and even I found plenty of interesting facts I didn’t know in there. Title: Knowledge Encyclopedia Human Body!